Most of the health care insurance in this country is covered by employers, who offer insurance as a part of a benefits package designed to attract and retain quality employees. While most people view it as an entitlement, to many of us health insurance is really a perk. Considering that it’s a fringe benefit, you shouldn’t be shy about asking your employer to cover vision therapy. Too often, health insurance companies get painted as the bad guys when it comes to coverage. However, these companies are simply responding to the requests of their customers, your employer. Insurance companies present health care packages, and then negotiate with employers on the specifics. The bigger companies tend to have more negotiating power. GE, for example, has thousands of employees, and can guarantee an insurer hundreds of millions of dollars in premiums. Naturally, the insurer will bend over backward to keep a company’s business. If more employers would step forward and demand that insurance companies cover vision therapy, we’re certain you’d find policies changing. What creates that kind of demand? Believe it or not, it starts with you. If you work for a big company, don’t be shy about asking them to make an exception if you or your child needs vision therapy. We’ve had large employers make exceptions for our patients before. The worst that can happen is they’ll say no, and then you can pursue alternative financing. However, if more and more employees ask for coverage, eventually it could become part of our health insurance package. It’s not unlike the chiropractic field. As more and more people sought out chiropractors, insurance companies were forced to make adjustments. 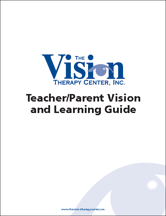 If you do decide to ask your employer for assistance, please contact The Vision Therapy Center. We’ll be happy to provide you with any materials that will show your employer what a critical medical need this is for you or your child. If you have questions, please contact Kim Jelinske.